A double race weekend for Gosse this time. On Saturday he was in the Czech Republic for the World Cup, one day later Gosse was racing in Switzerland. Saturday Gosse started in the fourth World Cup of the season in Tabor. He had a good start and was in the top-30 after two laps. “Halfway the race I made a mistake and I slide out of a corner. I lost a lot of places on this fast course. Then one lap later I was involved in a group crash and I lost even more spots. So within 2 laps I was going from my best to my worst World Cup result in the elites so far”, Gosse reported after the race. He finished 40th. 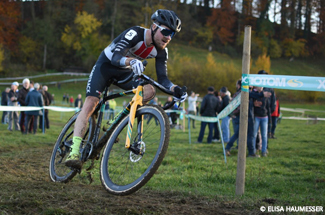 After a long travel Gosse lined up for the EKZ CrossTour in Hittnau on Sunday. He had another good start and moved up to a top-10 position. In the second half of the race Gosse dropped a few places. “I ended up in a group of 6 riders. Still I believed in a top-10 finish, so I tried to save a little energy for one all-in-attack. In the final lap I gave it a go for position 12, but with half a lap to go the group got back on my wheel. In a long uphill sprint my legs were completely empty”, said Gosse (19th) after the race. Next weekend Gosse will race a World Cup again, his third of this season. The World Cup will take place in Koksijde, Belgium.